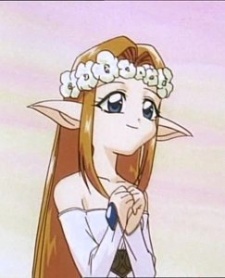 Hanazono No Utahime "Saki, Kahimi"
Utahime is a forest elf known as the "Voice of the Green Wind" due to her ability to summon life force and make plants grow through her song. She lives in a valley where she gathers plantlife from all over the globe, along with an arboreal ancient. She seems feeble and delicate, but is very powerful in battle. She has a bit of a crush on Mondo. In the Mon Colle Kids manga, she is shown to be able to take on a human form, in which she visits the other universe and attends to same school as Mondo and Rokuna. Here she befriends the boy Daisuke and gives him a pair of magical gloves. In the anime, she is referred to with Utahime-san. In the Saban-produced dub she is called Kahimi, and in the Mon Colle Kids manga she uses the name Saki (Hope Blossom) in her human form.